This pier is my last year project after 3 years in this hobby. I built it on the corner of my balcony as new part of my home. There's CEM60 keep permanently on it with mid-size barrel weather cover. No space for telescope now. There're AC power/Ethernet with humidity control device set to 50% when cover is on. So far so good, last imaging session was excellent. 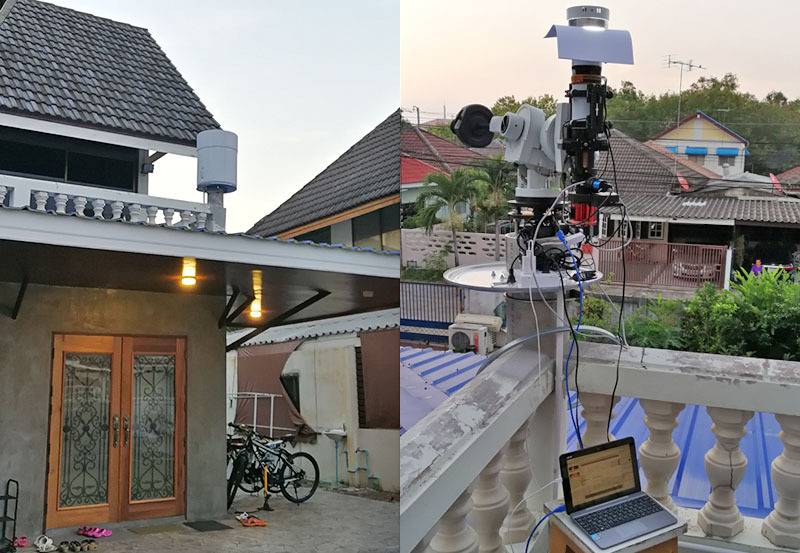 The next plan is to remote imaging and I need to up size this housing to keeping telescope inside with motorize open roof. New housing internal size will be around W180xD110xH100 (cm). There will be access door at balcony side. Housing will be elevated around 90cm from balcony floor, removable housing floor might need for maintenance access. Because I have no much space and 75% of area around the pier is not accessible. I think this roof open concept may be a good idea. I will start with manual version. I can open by just push the roof and close by pull back the rope. Actuator will come on later year after mechanical was proof as good. And I always miss something when I imagine alone. I'm starting something new, all the comment will be appreciate. I'd suggest experimenting with the lengths of the two arms ands the placement of their pivot points to get an orientation on the roof when open such that it isn't prone to act like a sail should a gust of wind arise. Why not use those heavy duty drawer slides? No need to muck around with pivoting roof. I am going to use two sets to makes 6x6 split roof ROR in my backyard. 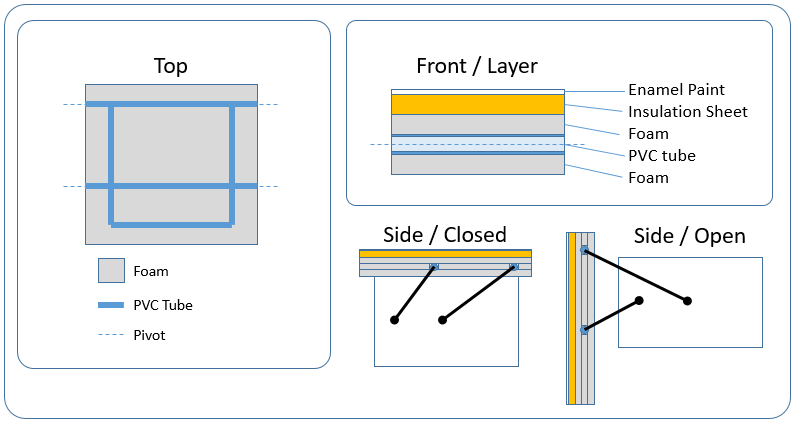 Increase to H100 to fit EdgeHD 11"
Here is updated PowerPoint sketch sheet. I think new 130mm size is too big. So, I think about make it hexagonal too. I also update flip open roof mechanism as per Brett Waller advise in #2 comment. Now it parked vertical and stay very close to housing. Edited by szg, 26 June 2018 - 09:11 AM. Thanks! I updated the design. Yeah! I still thinking about drawer rail but I'm not sure how to seal the roof. With my plan to store optics in here 24/7, housing must be insulated & air-tight when closed. Otherwise, weather control device will need more energy ($$$). Current roof & access door design is magnetism, the same way as refrigerator. I just feel swing open mechanism is look familiar to me . Edited by szg, 26 June 2018 - 10:19 AM. Sides plus a set of short linear actuators. 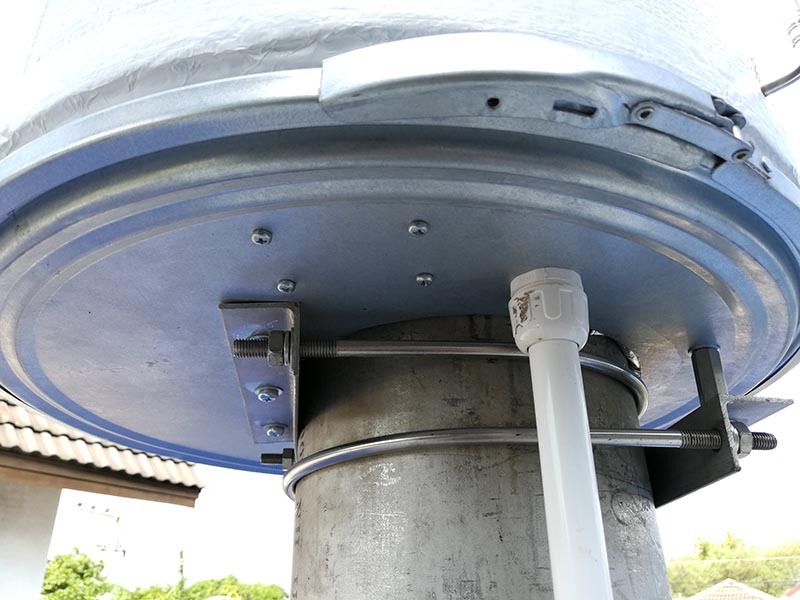 The actuators lifts the top so the top can slide and move, and when closing pulls down to seal. Sound easy enough right? Edited by gotak, 26 June 2018 - 01:32 PM. 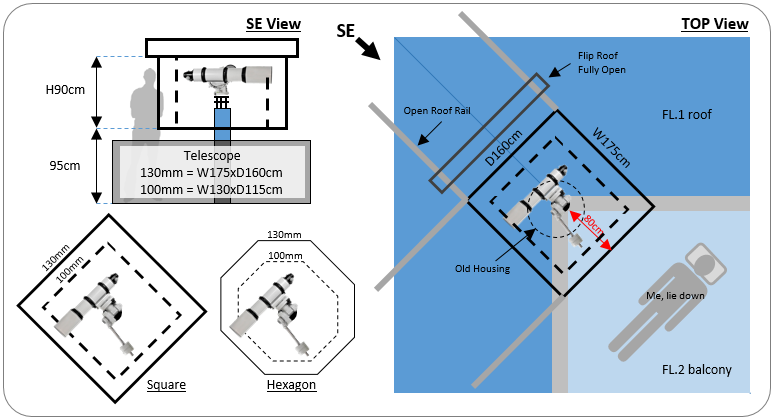 Interesting concept, I'm looking into ideas for a small imaging-only observatory as well. Where did you find the weatherproof canister in your current setup? I tried Googling "mid-size barrel weather cover" and didn't find anything similar. I like the simplicity of that and may consider going that route and taking my OTA off if it won't fit. Also, you mentioned you have some means for controlling humidity, what is it? That seems to be one of the bigger issues with sealed units like this. Edited by Todd1561, 26 June 2018 - 02:31 PM. Their use of materials and the Dacron covering process may be the main takeaway for your project. 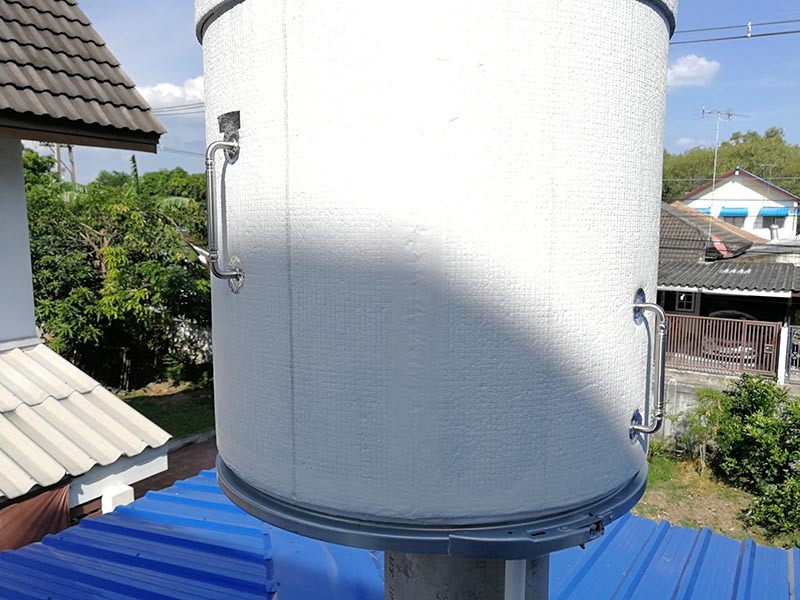 It sounds like it makes a well insulated, light and airtight enclosure when done properly. I think it called fiberboard drum. I'm in Thailand and came across this drum at road side coffee shop. They use bigger drum as a coffee table and smaller drum for a stool. They told me they purchased them from 2nd shop in Facebook, where I purchase it ($10) for the same coffee table concept at my home. My barrel used to be a container of medicines. So, it's very well built with steel lid, rubber seal and fastener lock. Eventually, after my usual imaging session, I try to store CEM60 upside down with counterweight shaft inside. Lately, I cut the hole on steel lid and fixed it to the pier. I sealed every gap around pier and lid by aluminum foil tape. For humidity control, I use AC mini dehumidifier ($30) + hugrostat ($15). It's a cheap made and may cause fire. So, I replaced AC/DC converter inside with a quality one and add protective fuse. Thanks to remind me! I almost forgot this design. My pier plate is Dan's and this motel'o replica was my initial plan but end up with current drum because I was too lazy. Edited by szg, 27 June 2018 - 04:19 AM. Ah thanks, I was able to find it with that name. Since it's just fiber material how did you protect it from the weather? I use insulation material like in below link. I'm not sure how to exactly call them in English. The one I use is 10mm thick. I wrap 1 layer, 2 layers on the top and paint with white enamel. Install 2 stainless door handles for moving. (All you can see in my first picture). 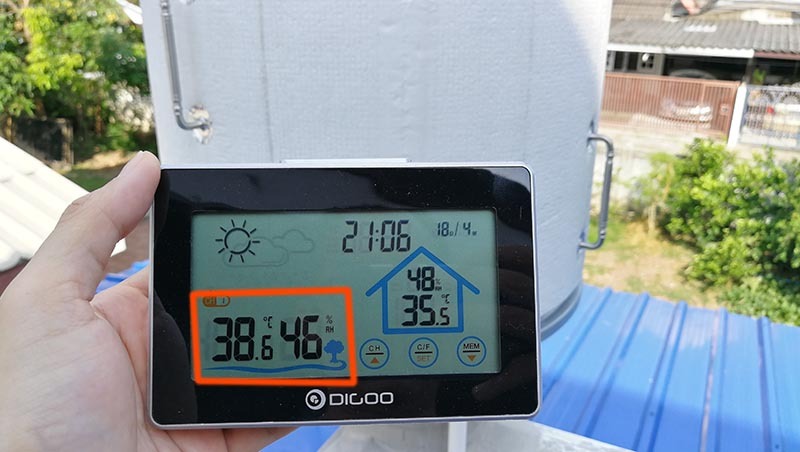 Max temp on sunny day is around 40 deg.C, should be OK to store mount only. More pic of my current pier for Todd1561. My wife just approved me for this new project. To fit 130mm APO, Housing will be too big for the balcony, I will stick with design for 100mm. The size for 100mm also very big compared to the current one. Here is my very first actual scale draft. Octagonal design looks good to me with more complexity to built. Also tried to design a sliding roof as per gotak suggest in #6 post, housing roof will hit my house's roof for inward directions. Only option is to slide it outward and support rail have to extend over 1st floor roof. This will be tough for maintenance. However, I planned to slowly built it and keep revising the design, there will be a lot of changes. Edited by szg, 01 July 2018 - 09:21 PM. Thanks for the detailed pics, very ingenious idea, I may incorporate some of it in my own plans down the road. How goes your planning on the new obs? Just to update, I finalized drawing to contractor for housing construction last weekend. They will built housing body with no roof. It must be strong enough for me to get inside for maintenance. After complete, I will built roof from PVC tube, foam & few aluminium reinforcement. Here's the idea. 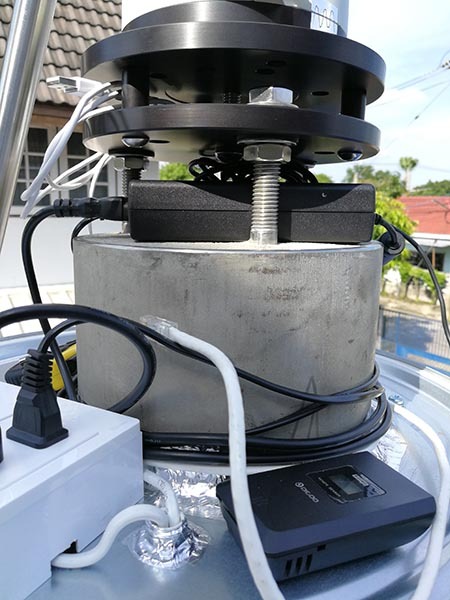 Roof must be light weight as possible to reduce actuator load. Should be less than 10kg so, I can use cheap linear actuator to drive it. It's a long way go. 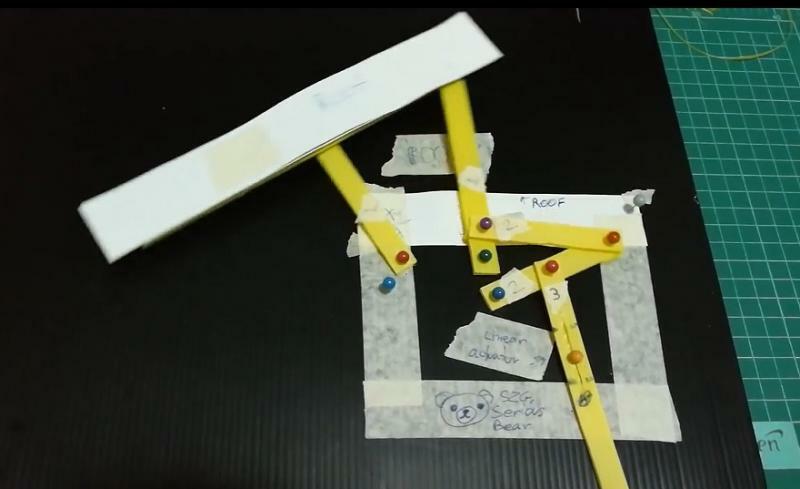 I did some experiment on open mechanism. Just for fun, not the final one. Very ingenious mechanism. Could it not be simplified by placing the linear actuator between the purple and red pins and do away with extra arm assembly? Tricky bit will also be figuring out how much power it'll take to overcome first opening and closing the rig. Could be a sizable actuator. Edited by Todd1561, 13 July 2018 - 10:55 PM. Thanks!!! I need to extend right bar to lower level to get this worked too. There's sweet spot to get opening & closing forces around 500N (8kg roof). Travel = 64-27=37cm. I'm thinking about put a single actuator with stabilizer. If not success, will be one on each side. Maximum force on each joint in is less than 600N (2-side, so it will cut by half + some friction), I think sandwich flat bar or angle aluminium arm with M10 bolt should be enough. There are plenty of cheap 1000N linear actuator in eBay. I have one with 10cm 500N for another project, will trial with 2D 1:4 model. I'm not a mechanical guy, thanks again for this. Edited by szg, 14 July 2018 - 12:40 PM. 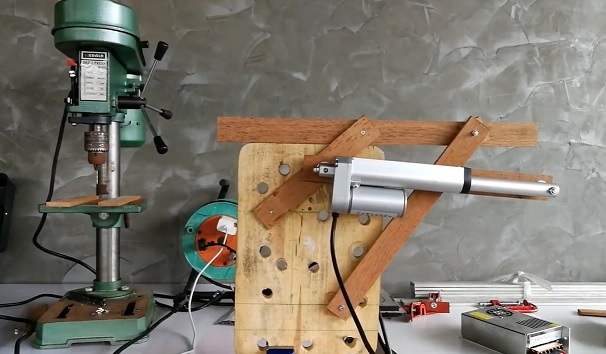 Here's 1:4 scale with linear actuator operate! Very nice, I'd say you definitely are a mechanical guy, must have been a job figuring out all these angles. I look forward to see this in action on the full scale roof. I changed my mind because I'm not confidence about weather seal. So, I start from a small build, reduced version for my AVX & AT65EDQ imaging setup. 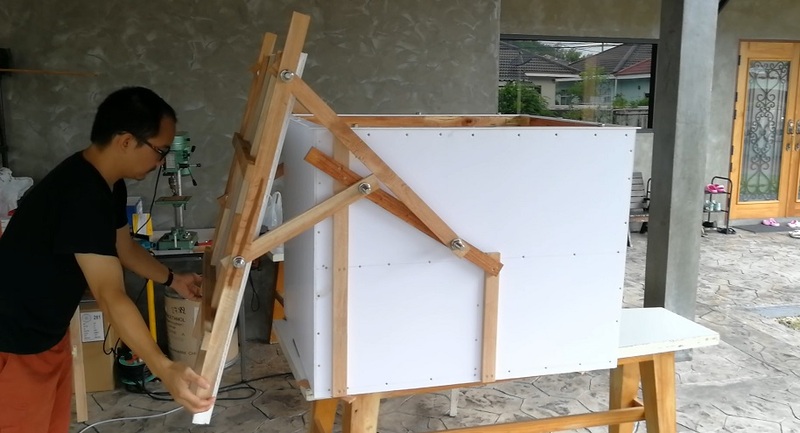 It built from wood & pvc board. This housing have to install on pier, I think I have to keep CEM60 in storage case and play with AVX this winter session. It's manual operate. Linear actuator is on the way, will update again soon. 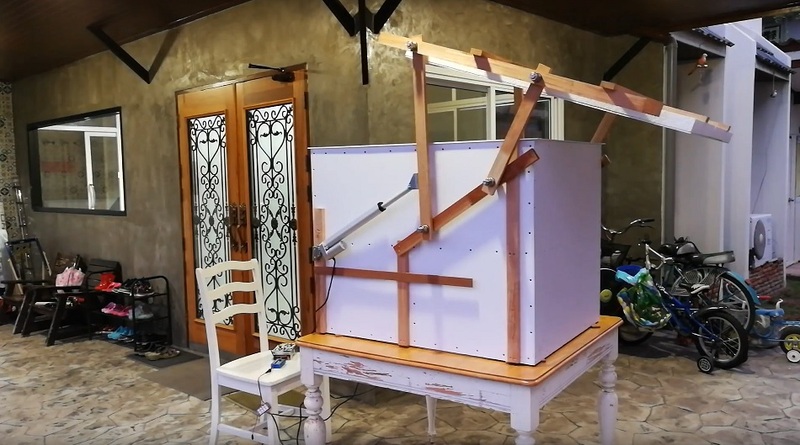 I designed, and built a working scale model of, a very similar system for a two-roof-panel observatory, which would be hand-operated, as I can get to both sides - building on the ground - and my 1/4 scale model works fine. 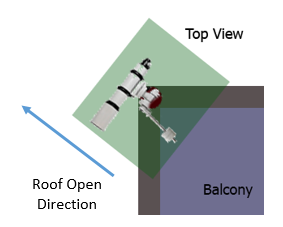 I plan next spring to build a full-size 3m x 3m observatory using this roof idea. It's important to minimize roof weight. With 3x3m size, I think you have to find a suitable position for counter weights. 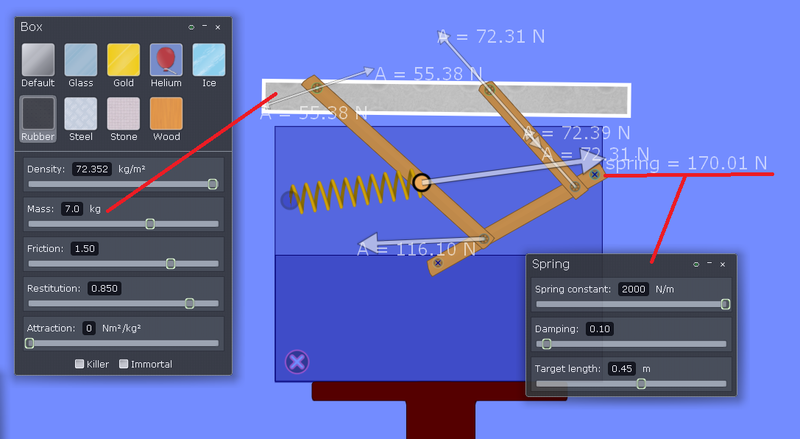 It's a fantastic free 2D simulation software. Where I placed those pivot joints just transfer from the simulation. This software can set weight of each piece of structure (i.e. 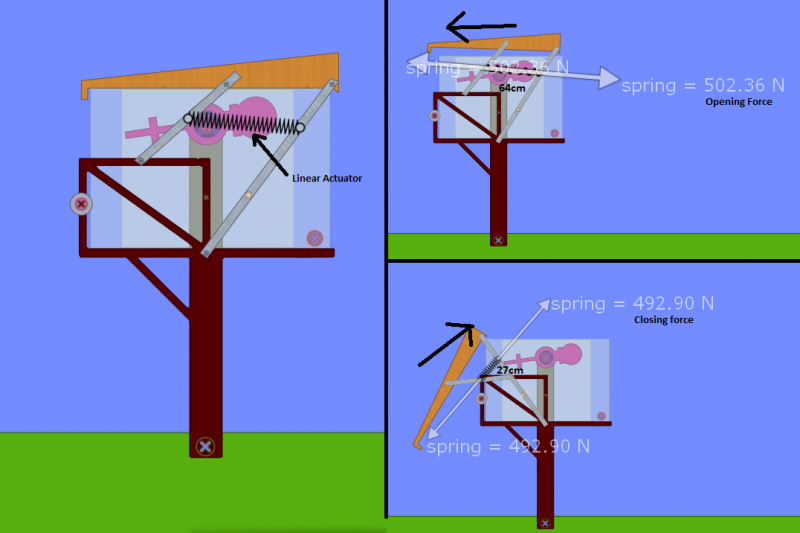 my roof in design is 7kg) then simulate force & estimate axial load on each pivot. In my simulation, I known my 7kg roof will start moving by 170N force from spring. I should easily open it with 2x 250mm stroke 500N linear actuator, just $50 each and they're on the way. counterweights will probably be steel plates perhaps 3 cm thick, attached to cables attached to the lower edge of the roof panels, and over pulleys at the top of the walls. 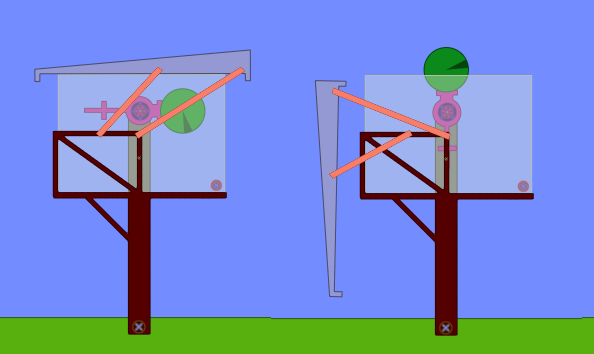 As the roof, as shown in your simulation above, moves to the right - opens - the weights will rise along the inside of the wall. Just received linear actuators this week. Here's the move. I have to adjust linear actuator on opposite side around 1-2 cm as you can see it close later in final. It also leave small gap between roof & housing. Then, the rest will be sealing, poly-carbonate outer roof & cosmetics. Edited by szg, 20 August 2018 - 07:55 AM.